Posted in: Kyosho, Radio Control. Tagged: New Releases, Racing, RC. The ULTIMA SC line has consistently competed at the highest level. To maintain its advantage, the ULTIMA SC has undergone a complete evolution into the new ULTIMA SC6 model. 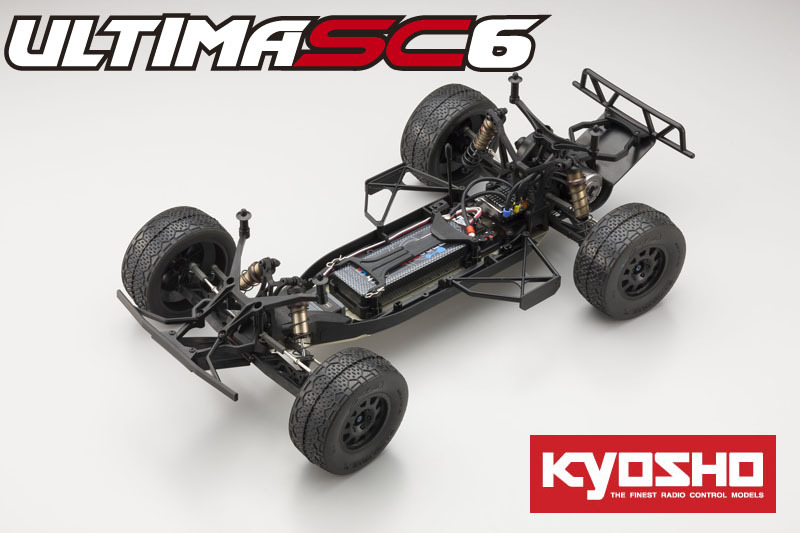 A convertible Midship or Rear motor duralumin chassis with tungsten diff balls, aluminum steering rack set, and all the adjustability of the IFMAR world champion RB6 combine to deliver a sharp increase in speed. These features also improve durability and strength so the risk of damage during practice or club racing is reduced, allowing you to run your machine for the pure fun of it with peace of mind. The suspension design incorporates gullwing rear suspension arms and provides precision setting of the damping ratio to achieve optimal running characteristics. In addition, the midship motor layout matches the model to high-grip surfaces such as carpet or astro to produce nimble control and movement. The motor can be converted to a rear mount to produce optimal performance on rough or loose surfaces as well. Compatible with various battery types, a mount for separate or short-type Li-Po batteries is included that allows the mounting position to be moved between front-rear. The new ULTIMA SC6 racing machine is designed to respond decisively to the driver’s commands. 6.) Velvet coated big bore shocks with new “bleeder” style caps.